A poorly defined area of low pressure located about 90 miles south-southeast of the southern tip of Baja California is producing a large area of showers and thunderstorms within a few hundred miles of the coast of western Mexico. Surface observations and satellite data indicate that a tropical storm may be forming and advisories will likely be initiated later this morning. 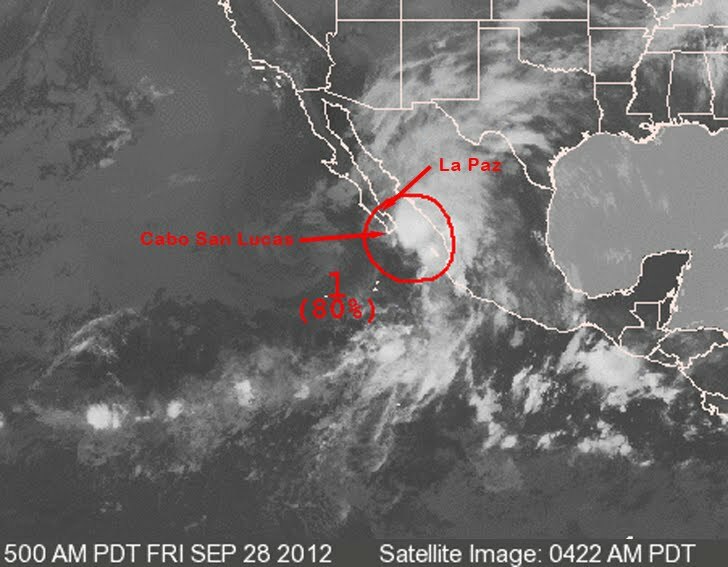 If this occurs tropical storm warnings would be required for a portion of the west coast of mainland Mexico. This system has a high chance - 80 percent - of becoming a tropical cyclone during the next 48 hours as it moves northward at 20 to 25 mph. Regardless of tropical cyclone formation tropical-storm-force winds are possible along the west coast of Mexico between Mazatlan and Huatabampito during the next day or so. Locally heavy rains are already occurring along portions of the coast of western Mexico and could cause life- threatening flash floods and mud slides over the next day or two.